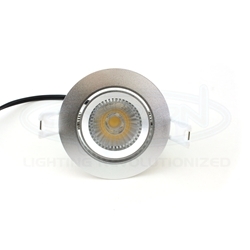 3 inch recessed LED downlight for cabinets and shelving units. AC-COB LED technology works directly with 100-120VAC without usage of drivers or power supplies. Pre-wired with 8ft AC cord. Cord can be cut off for hardwired applications. Can be used in hotels, conference/meeting rooms, factories, offices, commercial and residential buildings.